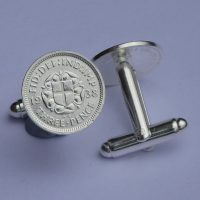 The “Christmas pudding” Silver Threepence has been made in to coin cufflinks. Available in 1937, 1938, 1940 and 1941 for a special personalised birthday or anniversary gift. Price: £22.00. Silver plated on top of the 50% Silver of the original coin.